Not since the July 22, 2013 fuel survey have gas prices been so high; in fact, the current survey from the U.S. Energy Information Administration shows the price of a gallon of regular unleaded is only one-tenth of a penny less than it was nine months ago, when prices were rising amid prospect of U.S. military intervention in Syria’s civil war. Of course, that number is the national average, and some prices at the regional level are much higher than the broader U.S. figure. 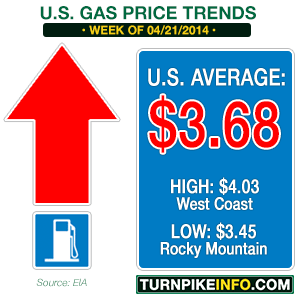 As it stands, the price of gas is now $3.68 per gallon at the national level. What is worse, at least one region, the West Coast, now has figures, officially, above $4.00 per gallon for the first time since March of 2013. The news for truckers turned sour during the past week, as well, as the price of diesel also rose about 2¢ per gallon to $3.97. Diesel had been holding stead or declining in most regions of the U.S. in recent weeks, defying the broader consumer price trend. Uncertainty in overseas markets, particularly with the persistent Ukraine crisis, have created a certain volatility in the futures markets, including the price of West Texas Intermediate. WTI futures were down about $2.00 per barrel in late morning trading Tuesday, but that was after hitting fresh highs on Monday that pushed the commodity to levels not seen since the beginning of March. At that time, the WTI flirted with $105 per barrel, but the price spikes were transient, only touching upon price levels were last seen during the summer of 2011. So far, April’s upward run in the WTI index has been more persistent. The price increases in WTI have come despite the fact there has been an increase in crude oil stocks in recent weeks. That increase has had many analysts predicting futures prices would begin to decline. Bob Yawger, director of the futures division at Mizuho Securities USA Inc. in New York, told Bloomberg News this morning that the recent expansion of crude stocks was causing some bearishness in futures markets. “The market is moving lower on expectations that we’ll get another supply build in tomorrow’s report,” Yawger told Bloomberg. As TurnpikeInfo.com reported last week, Yawger is one of many energy analysts who have expected futures prices to turn lower, which could lead to a decline in gasoline prices once summer gets underway. U.S. gasoline supplies have fallen dramatically in recent weeks, all while consumer demand has been going in exactly the opposite direction. Chart: EIA.gov. Yawger’s analysis may be inspired, in part, by the fact this is the time of year when crude inventories usually peak. Refineries have been taking on new crude stocks in order to produce more summer fuel blends, but the crude stocks only tell a part of the story. The latest weekly petroleum report from the EIA shows overall refined gasoline stocks are down in recent weeks, exactly the opposite of the crude oil stocks. In fact, total gasoline stocks are down about 5% from their levels at this time last year, while the demand for gas is up. The EIA’s tracking data show the demand for consumer gasoline is up almost 5% versus this time last year, exactly the opposite of the gasoline stock data. Furthermore, the anticipated duration of the current supply of refined gasoline and crude oil is less than it was at this time last year. Finally, the mid-spring is the time when crude oil stocks have traditionally reached their highest levels before falling throughout the summer months, according to the last two-years’ worth of data from the EIA. That means the current spate of stockpile increases could be coming to an end with the arrival of May. Overall, the major factors contributing to gas prices do not portent well for consumers. There remains significant political uncertainty overseas, which has contributed to the price hikes in crude oil, both WTI and Brent Light Sweet Crude. Add to that the lower overall supply of refined gasoline and higher consumer demand, and the pricing trend is likely to conspire against consumers for the next several weeks. Overall, gas prices are likely to continue rising through the late spring, at least. Depending on how Europe prepares for a potential fuel supply shortage amid the Ukraine crisis, those fuel price increases could continue into next fall.